What is going on with this cover of the Chinese edition of Harper's Bazaar magazine? Sarah Jessica Parker appears on the March 2013 issue, and if her photo wasn't Photoshopped in a truly bizarre way, then something has seriously happened to the actress' appearance. 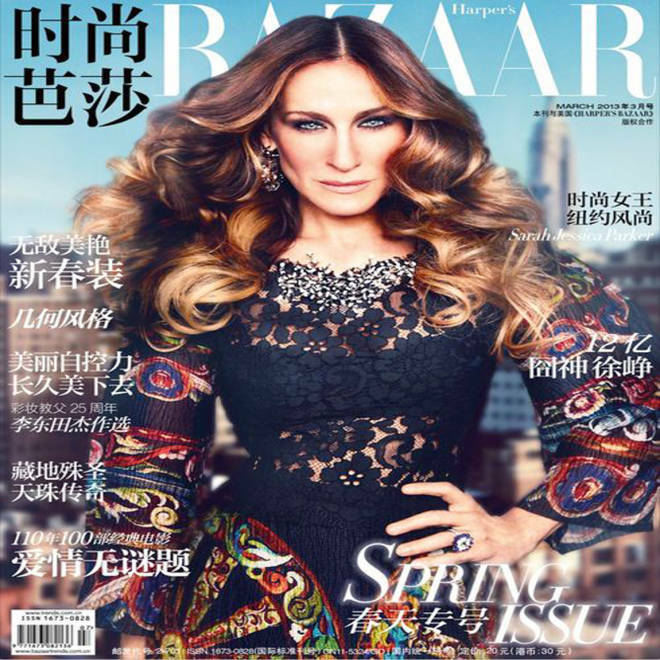 Sarah Jessica Parker on the March 2013 cover of Harper's Bazaar's China edition. PS Disasters, which highlights Photoshop mess-ups, think they see a space alien resemblance, and they might just be right. And The Huffington Post points out that Parker has gone under the Photoshop knife before, with Marie Claire and Elle committing some weird photo plastic surgery. Readers of the China-focused blog Shanghaiist shared their Parker thoughts on the blog's Facebook page. "Wow... every tool in photoshop and then some.. and yet somehow she looks like a demonic alien," wrote Ilsa Mac. Ben Blanchard saw a "Wizard of Oz" similarity, writing "She looks like the wicked witch of the east. Quite terrifying!"